After 65 years on this rocky road to the land of the redeemed I've heard all the popular evangelical catch phrases a million times...well, maybe that's an exaggeration. Phrases like "God has a purpose in all of this." "Just keep trusting Him." "He will work things out." "All things work together for good to them who love God to them who all called according to His purpose." "Count it PURE JOY when you face various trials." "It will be worth it all when we see Jesus." "Cast all your care upon Him, for He cares for you." I've heard them all and, guess what, they are all true. I believe every one of them. They are biblical! But when these statements are dumped on you when you are in the dumps they can sound awfully hollow. I know! I've been there! I'm still there! 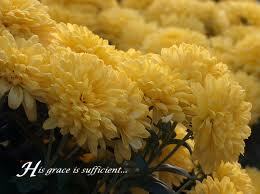 "His Grace is Sufficient" is another one. What does that mean anyway? His grace is all I ever will need? What about a job, a friend, a hot meal, warm clothing, shelter? Is His grace able to suffice in these needy situations? All I can say is YES. I can't explain it. I don't always "feel" it. I sometimes doubt it. But when I come to the end of the day with all of its "stuff", I can sing "His Grace is Sufficient". (click on the link) Because it just IS. Believe me! David, I understand that it might "sound hollow", but ultimately is there any other comfort we can offer each other outside of His glorifying truth? When my mother was in the slough of despond, I could hug her, and sit with her in silence, but the only truth and hope I had to give her was His, even though for many months it appeared to mean absolutely nothing to her.